ALTOONA~As the Great Famine began to ease in the early 1850s, about 450 Irishmen began working on an extraordinary engineering project in south-central Pennsylvania. Their accomplishment remains in place today as a vital segment of the American economy. Working with only picks, shovels and some explosives–but no machinery–the men shaved the face of adjoining mountains to fill in two ravines and lay the grade for a railroad line. They built the Horseshoe Curve for the Pennsylvania Railroad. A display at this National Historical Landmark, about 10 miles west of Altoona, offers only a few details about the men. They are said to have been recruited for the job because they were “former mine workers,” mostly from counties Cork, Mayo and Antrim. Keep in mind this project was completed 20 years before the Molly Maguire unrest began in Pennsylvania’s anthracite coal region, some 200 miles to the northeast. The 2,375-foot curve, which opened to freight and passenger traffic in February 1854, reduced the trip between Pittsburgh and Philadelphia from 20 days by wagon to about 15 hours by train. It remains part of the nation’s critical east-west rail corridor. 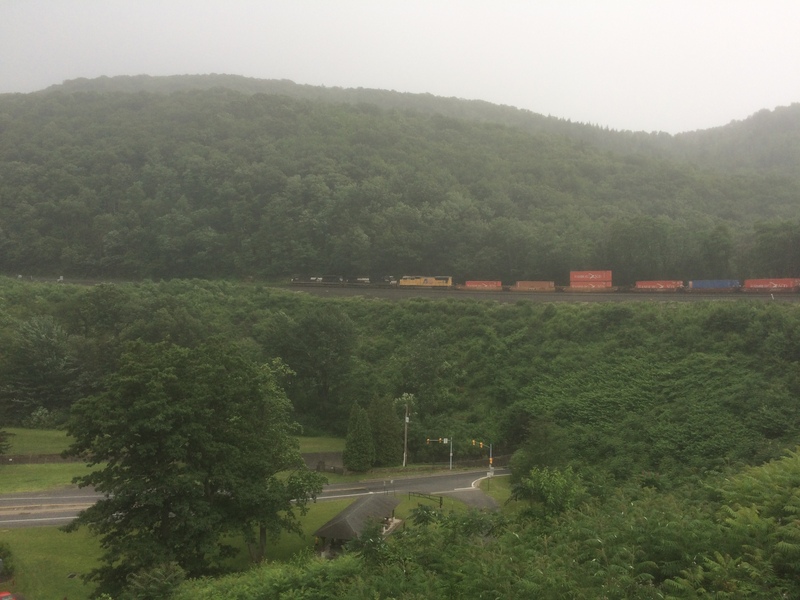 A westbound freight train climbs the grade through a light rain in this July 2017 image. Below, trees obscure the entrance of the road tunnel. This entry was posted in Business & Environment, History and tagged Antrim, Cork, Mayo, Molly Maguire on July 1, 2017 by admin.